This soothing book is the perfect invitation to a relaxed afternoon of cloud gazing. It starts by encouraging young readers to observe what clouds look like, from thin wisps to puffy air castles to giant faces. Then the story raises natural questions: Where do clouds get water? Why does it rain? When rain makes puddles and puddles dry up, what happens to the water? The answers give children an easy-to-grasp picture of the water cycle while instilling the kind of curiosity that can lead to a lifetime of experiencing the world from a scientific perspective. 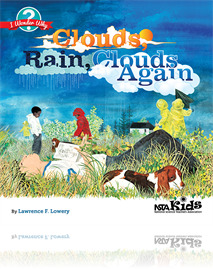 Clouds, Rain, Clouds Again is part of the I Wonder Why book series, written to ignite the curiosity of children in grades K–6 while encouraging them to become avid readers. These books explore the marvels of geology, land forms, weather, environments, and other phenomena related to science and nature. Included in each volume is a Parent/Teacher Handbook with coordinating activities. The I Wonder Why series is written by an award-winning science educator and published by NSTA Kids, a division of NSTA Press.